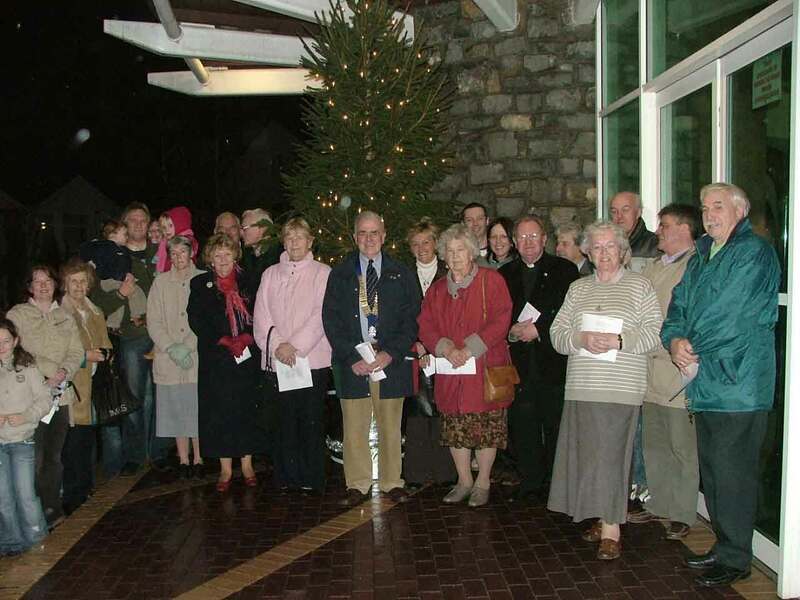 Our annual Christmas Tree of Light is organised in conjunction with St Mary’s Church who very kindly agree to site the Tree outside the Church on Ewenny Road, Bridgend. The Christmas Tree is decorated with hundreds of white lights and is set up under the canopy of the church in early December. 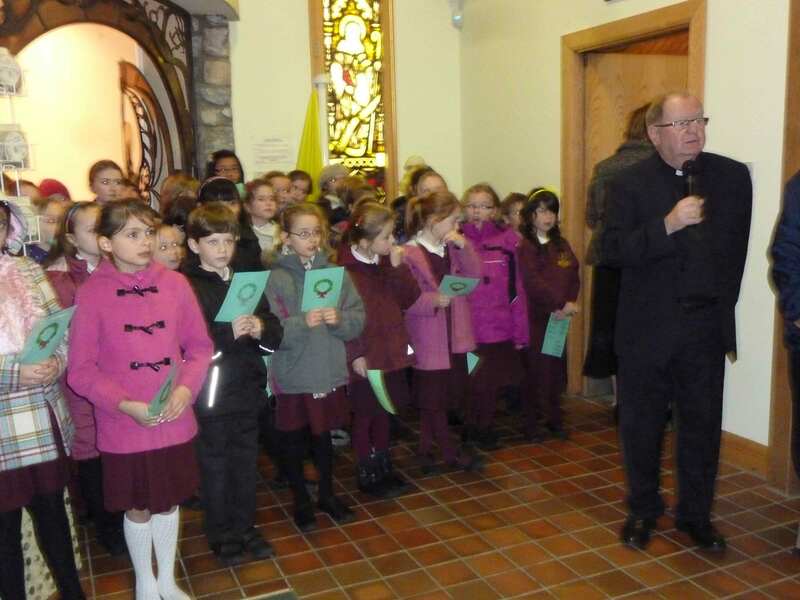 A short dedication service is held before the lights are switched on, with Christmas Carols led by St. Mary's School Choir. 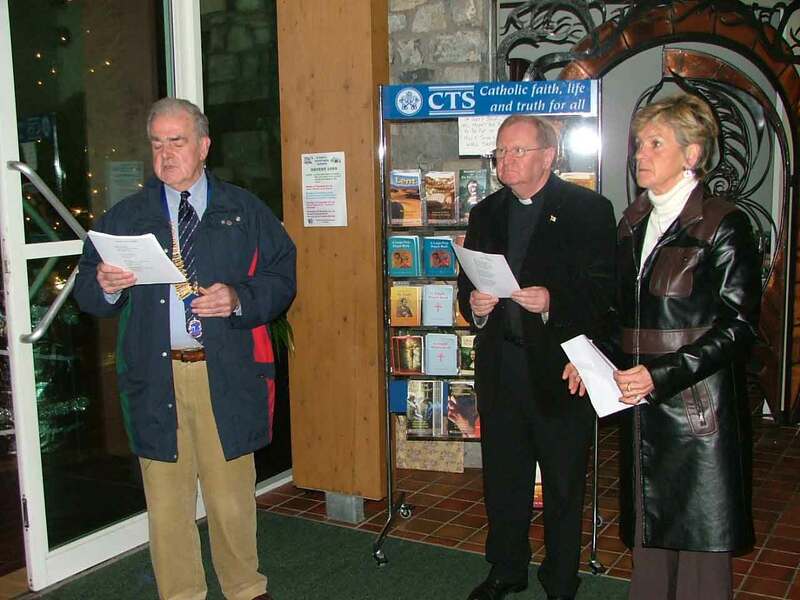 The dedication was held on Monday 3rd December 2018 at 6pm. . 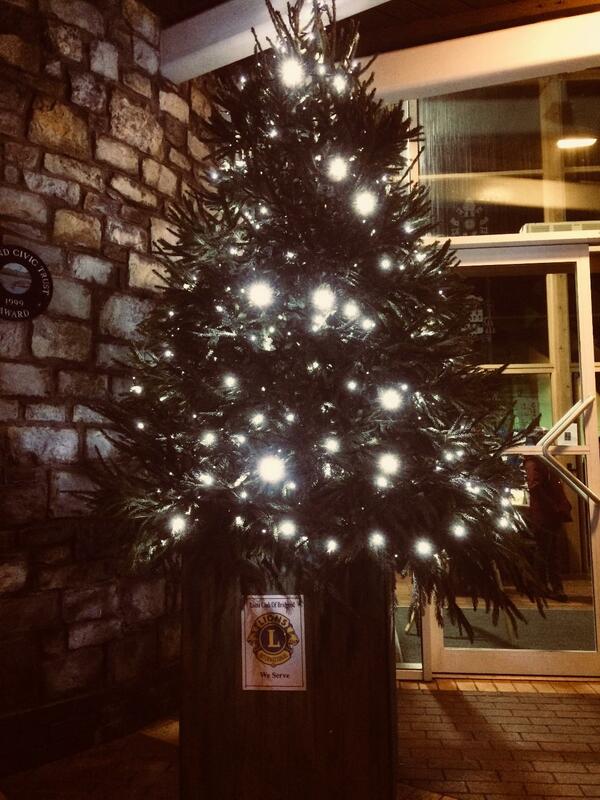 The Tree of Light is a point of focus for people who want to remember a loved one or a special cause at Christmas. Individuals can dedicate a light on the Tree for £5.00 and the name of your loved one(s) or cause are recorded on a board kept alongside the tree for all to read. Throughout the Christmas period the board is updated constantly as new names are added. Forms will be accepted right up until Christmas Eve. The 2019sponsor form can be downloaded nearer the time - just print it, complete your details and post or deliver it to the address on the form or hand to any Lions Club member. 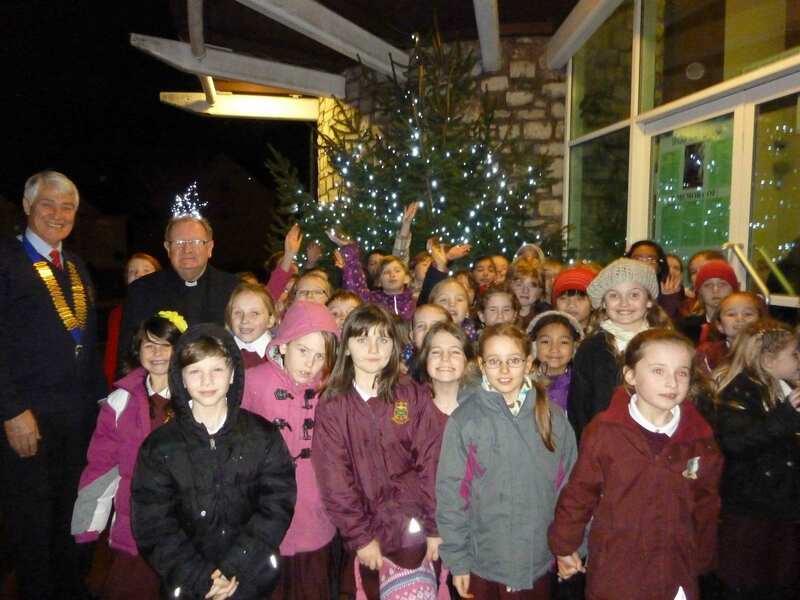 The Tree has enabled us to raise over £8,000 which has supported not only local causes such as Heronsbridge School but has also contributed substantially to a Lions International project (Campaign Sight First II) which has helped to prevent blindness in more than 24,000,000 people in developing countries. 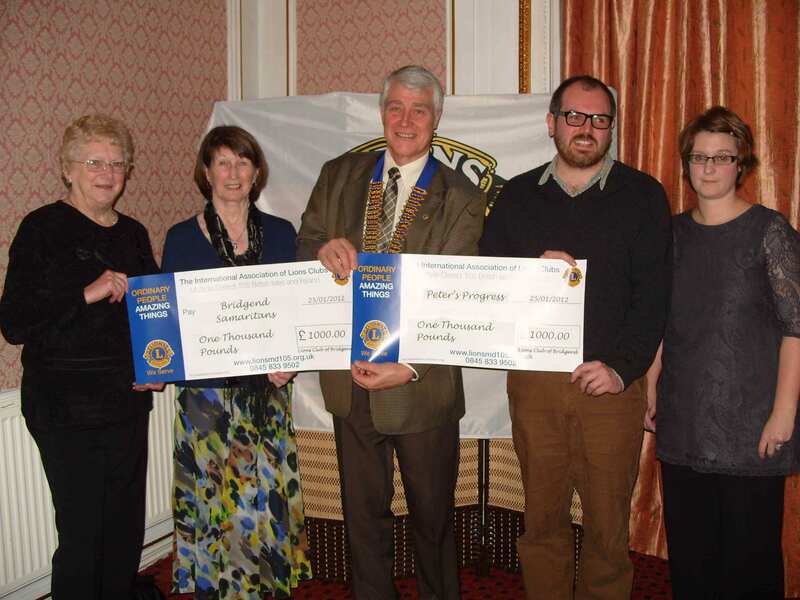 In 2016 the proceeds were divided between Emmaus Bridgend and our own Lions Club Charitable Trust Fund. To mark the switching on of the lights a short service of dedication is held around the tree when all sponsors and anyone else interested are invited to attend. 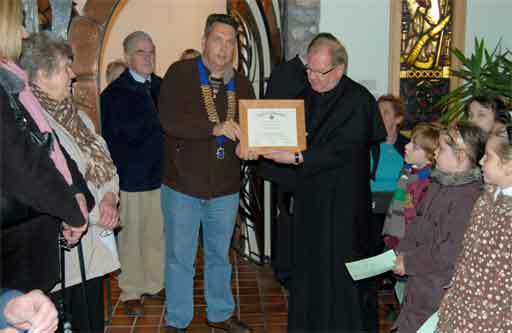 Lion Simon Dawkes presents a Certificate of Appreciation to Father Isaac in December 2008. 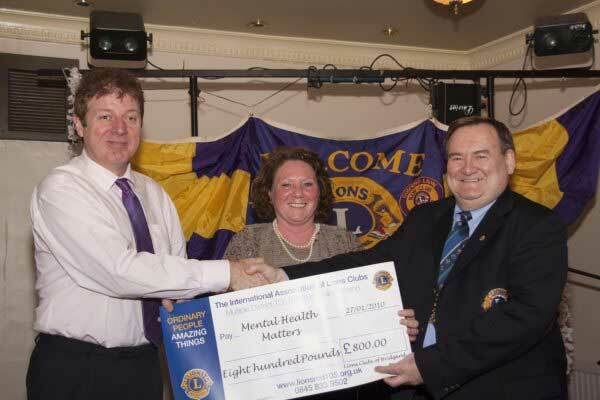 The picture below shows representatives from Mental Health Matters receiving a cheque for £800 (one half of the proceeds of the 2009 Tree of Light) from Lions President Godfrey Morris.